1. 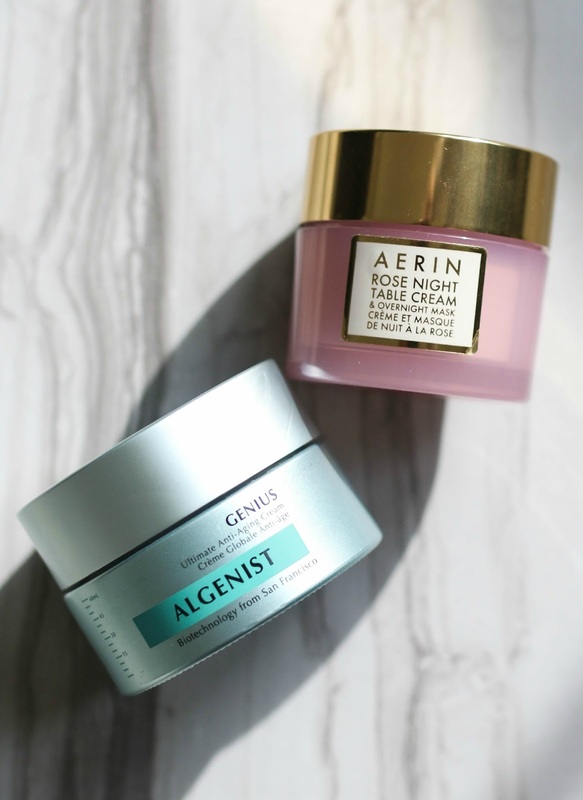 Aerin Rose Night Table Cream - While I have a ton of anti-aging serums and creams, I still reach for products that provide intense hydration. One of the best ways that I keep my skin looking its best is by keeping it hydrated. This night cream by Aerin is delicate, calming, soothing and incredibly nourishing which I greatly need in the colder weather. I find myself even scooping a bit out for my morning routine on days when my skin requires a bit more comfort. 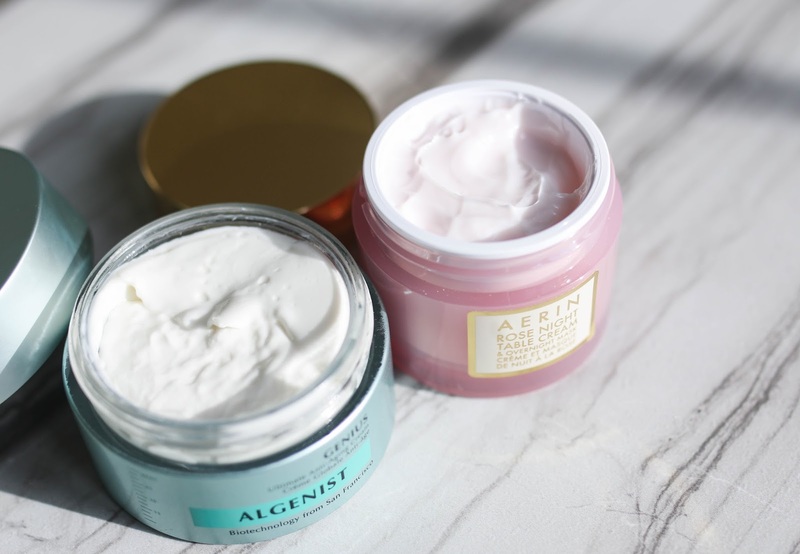 As I am already a fan of Aerin's skincare line (love this oil and recently discovered this cleanser that is lovely for winter), I knew that this overnight cream would be a great addition to my collection. For those that are averse to fragrance, just note that this has a rose scent. Not overpowering, but it definitely lingers on my skin for about 30 minutes after. I find it to be calming and one of the reasons I am drawn to Aerin's line over and over again! 2. 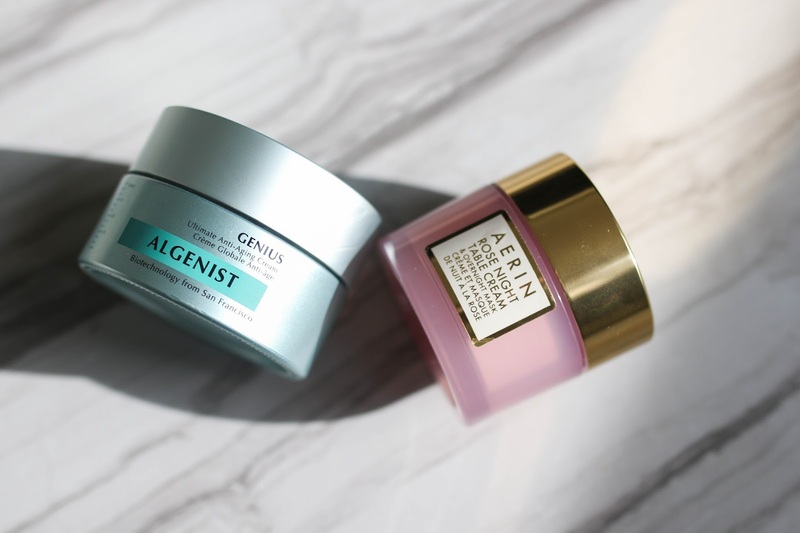 Algenist Ultimate Anti-Aging Cream - I haven't tried too many Algenist products, but so many of my readers tell me they are obsessed with the line! I've heard tons of buzz about the peel, the oil and this face cream. I was immediately intrigued because it is designed for all skin types, and targets almost any and all anti-aging concerns - fine lines, firmness, dullness, etc. While the cream looks quite rich in the picture below, I was shocked to find that it breaks up into a thin watery texture that instantly absorbs into the skin. My favorite way to use this is when my face is still damp from using a hydrating mist (this one is in my routine currently) and pressing it into the skin. It's as if my skin drinks it up because it disappears immediately and looks plump, fresh and radiant after. After using it for the past 2 months, I find my skin looks bright, even and while it's not incredibly apparent, there is some change in my skin's firmness. If you are looking for an overall anti-aging cream that targets a multitude of concerns, this may be a great one to try.